Mario Bros. Classic is a remake of the original Mario Bros., included in all four Super Mario Advance installments as well as Mario & Luigi: Superstar Saga. It features updated graphics and music, along with a multiplayer battle mode featuring a blue and yellow Mario. A track that may be unfinished, although it may be the beginning of the multiplayer and single-player bonus round results themes (see below). The Japanese version says "PUSH START", while the international version says "PRESS START". The hyphen in the copyright date was also changed to a comma in the International, but then changed back to a hyphen in the Chinese version. Japanese version uses the registered trademark (®) symbol while the International and Chinese versions use the trademark (™) symbol. 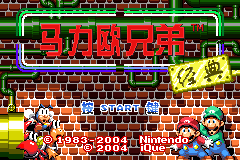 Chinese version's copyright date is 1983 to 2004 and added a copyright date for the iQue. The Chinese version also has its title in Chinese. The P and player number was flipped in the international versions. The Japanese bonus point counter had an apostrophe at the end, just like the original arcade version. This was changed to a period for the overseas releases. The option to select between single-player and multiplayer is found on the main title screen of the four Super Mario Advance games, but on the Mario Bros. title screen in Superstar Saga. The title music does not loop in the Super Mario Advance version. The fade out after pressing Start is white in the Super Mario Advance version. In all later versions, the fade out is black. After kicking an enemy while playing the Super Mario Advance version, Mario says nothing. The other versions added a short voice clip upon kicking an enemy.